Sip on these wallet-worthy wines from España. It goes without saying that France's winemakers produce some of the world's finest wines. But then, so does Spain. The difference is that España oozes good wine bargains, while French values are harder to come by. The fact is that Spain is now the world's biggest wine exporter. However, according to The Independent, Spanish wines sold abroad garnered, on average, less than a third of the price of their French counterparts. Quite simply, that means there are Spanish wine values to be had. Here are just a few of them. 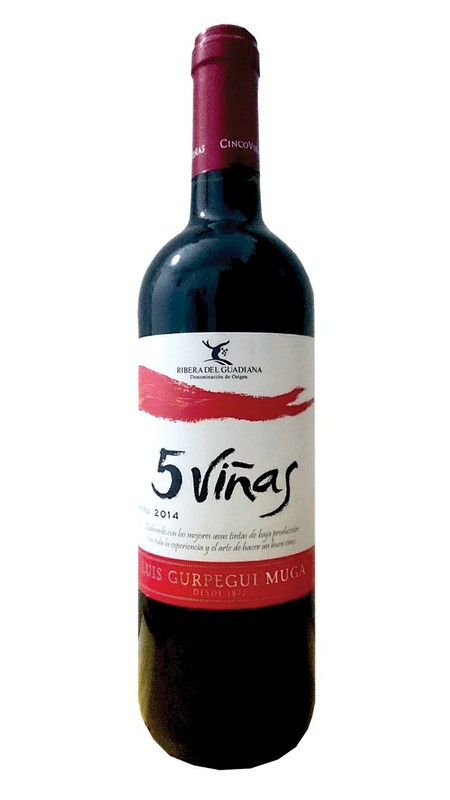 Buying $8 wine is a risky proposition—that is, unless it's 5 Viñas Tempranillo ($7.99) from Luis Gurpegui Muga family-owned winery. This light, easy-drinking, 100 percent tempranillo wine is loaded with fruit (plum and strawberry) and is fairly low in acidity. It's delicious to slurp with grilled and roasted pork dishes. I love it with Mexican-style carnitas. In a recent blind tasting of Garnacha wines from Spain, Bodegas Tintoralba Capitulo 8 Garnacha ($15.95) was easily my favorite; a full-bodied wine showing subtle balsamic and black cherry notes. The winery is situated in Spain's La Mancha region, and Capítulo 8 (Chapter 8) refers to Don Quixote and carries a windmill on its label, along with a quote from Chapter 8: "Fly not, cowards and vile beings, for a single knight attacks you." The stunning, Technicolor passion flower image on a bottle of Tarima Monastrell ($9.99) is eye-catching, to say the least. But it's the wine in the bottle that wins the day. Made from gnarly, ungrafted vines in the rugged Alicante that average 35-40 years—and aged in stainless steel—Tarima's semisweet notes of chocolate, anise, huckleberry and blackberry garnered 91 points from Wine Advocate's Robert Parker. I can certainly see why. It's unfortunate that I can't recall the restaurant server who turned me on to Señorío de Astobiza Txakoli ($12.99) because I'd sure like to thank them. Although this white wine is slightly fizzy, it's also very dry, high in acid and low in alcohol, which makes it a delightful aperitif or accompaniment to tapas and pinchos, but pairs nicely with sushi and sashimi, too. Rosé wines from Spain are particularly good values, and that's the case when it comes to El Coto de Rioja Rosado ($10.75). Winemaker César Fernández created this 48-hour maceration of tempranillo and garnacha grapes to extract color and flavor, followed by cold fermentation and bottling. Tangy strawberry and cherry flavors dominate, and healthy acidity makes this rosado a versatile wine to enjoy with salads, spicy foods, Mediterranean and Spanish fare or just as an apéritif to sip on the porch in warm weather. Another Spanish rosé worth tracking down is Cune Rioja Rosado ($13), made from 100 percent tempranillo. It's fantastic with fish, seafood and lighter meats like pork and chicken. Ribeiro wines from northern Spain are frequently good bargains and Coto de Gomáriz Ribeiro Blanco ($19.99) is one of them. This is a stunning blend of treixadura, godello, loureira and albariño, with honeysuckle and pineapple aromas, plus mandarin orange, lime and passion fruit flavors on the palate. Bone-dry and acidic, Coto de Gomáriz Ribeiro Blanco is a real beauty, especially with grilled seafood like octopus, blue- and swordfish. Grown in northwest Spain, the albariño varietal is one you really should get to know. Veiga Naum Albariño ($13.99) is produced in Spain's Rías Baixas D.O. (denominación de orígen), and is a solid expression of albariño's rich, ripe, clean fruit flavors. It's a full-flavored white wine that seems to have been built with complex vegetable dishes in mind.